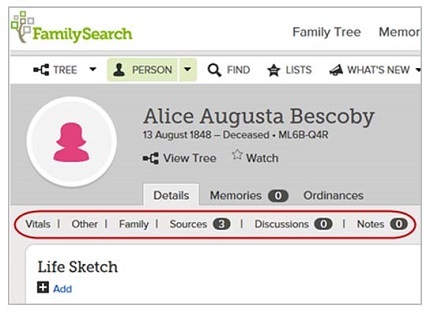 Getting around in FamilySearch Family Tree is fairly straightforward. But as with any web application or computer program, there are additional ways to navigate that may not be obvious. Here are a few tips that will give you added flexibility and may even save you time. 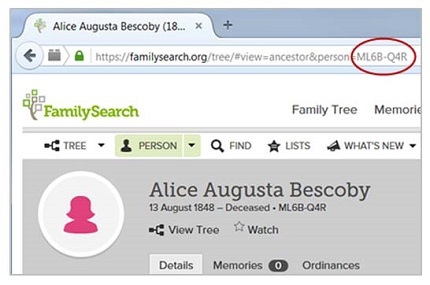 You may already know that clicking Tree puts the person in home position in Tree view, and clicking Person takes you to the individual’s Person page. But did you know that clicking the person’s name also takes you to the Person page? You can also click Sources or Discussions to go to the Person page. Clicking Memories takes you to the Memories tab on the Person page. 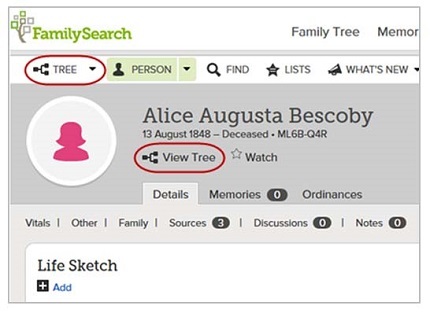 Tip #2: Family Tree keeps two separate histories of persons you’ve viewed — one for Tree view and one for Person view. These histories are available on the navigation bar at the top of each page. 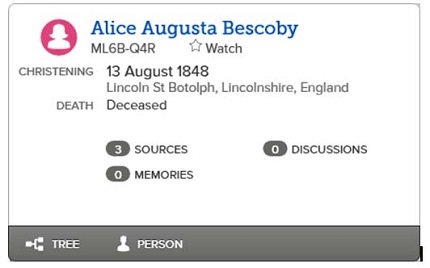 Click the Person button to go to the last Person page viewed, or click the Tree button to go to the last Tree view. Click the down arrow next to Tree or Person to see a list of your most recently viewed people, then click a name to go to that person in Tree or Person view respectively (the example below shows the Person history). Tip #3: The URL of the person you’re viewing always includes the Person ID. You can change the person ID right in the URL and then press Enter to go directly to the new person. Tip #4: The Tree page is draggable, just like Google Maps. To reposition the page, just click, hold, and drag. Tip #5: On the Person page, the section names under the tabs are clickable. For instance, to jump directly to the Family section, click Family. Tip #6: On the Person page, it’s sometimes easy to confuse the Tree and View Tree options. Clicking Tree takes you to the last viewed tree. Clicking View Tree under the person’s name takes you to Tree view and puts the person in home position. 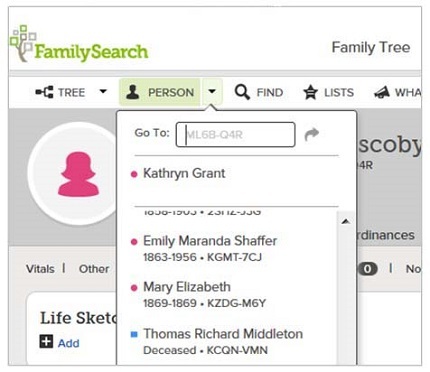 Enjoy using these tips as you navigate in Family Tree.